American businessman John Jacob Astor IV had the Maison Astor Paris, Curio Collection by Hilton built to be his Paris home in 1907. Astor had been a part of the hospitality world since the mid-1890s, when he built the Astoria Hotel on the Astor family property in New York. It was meant to rival his cousin’s hotel, the Waldorf Hotel, but instead the two joined to become the Waldorf-Astoria, a hotel known for its opulence and affluent clientele. The Maison Astor underwent extensive renovations in 2018 to restore, upgrade, and update the accommodations with more contemporary features. Guests staying at the Maison Astor can expect opulent guestrooms with plush bedding, luxury toiletries, and classic Parisian décor. Amenities include complimentary WiFi, a Nespresso machine, work desks, and turn down service. The on-site dining room provide guests with Paris-meets-New York inspired cuisine with fresh, local ingredients. There are two meeting spaces for business purposes, with dedicated event staff, flat-screen televisions, and LCD projectors. The 24-hour Clefs d'Or can assist with dinner reservations, tickets, and tours; a town car or limo can be arranged for trips in the city; and childcare services are available at this family-friendly hotel. Nearby are world-famous landmarks including the Louvre Museum, the Champs-Elysées, and Opéra Garnier. The hotel is located in the fashion district, near several haute couture houses and high fashion shopping on Boulevard Haussmann. Visit the Eiffel Tower and Le Madeleine Church, or stroll in any of the beautiful parks and gardens Paris meticulously maintains. The experience at Maison Astor Paris, Curio Collection by Hilton is only enhanced by the beautiful and magical City of Lights. 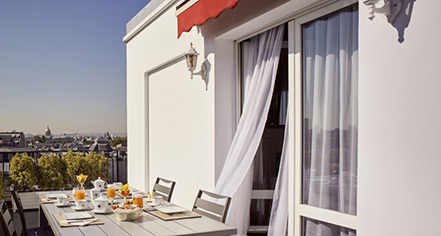 Maison Astor Paris, Curio Collection by Hilton, a member of Historic Hotels Worldwide since 2018, dates back to 1907. The building was originally home to millionaire businessman John Jacob Astor IV, who perished in the sinking of the Titanic in 1912. Age Requirements: Guests are required to be 18years or older with photo identification to reserve a room and check-in. Cancellation Policy: Reservations must be cancelled 24 hours before arrival time. Hotel/Resort Fees & Taxes: There is a $2.53 EUR ax per person, per night; this does not apply to children under 18 years of age. Parking: Limited on-site parking is available on a complimentary basis. Payment: All forms of payment are accepted. Payment is required at time of booking. Pet Policy: $100.00 EUR per pet deposit. Restrictions apply. 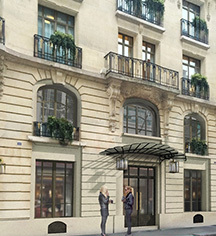 American businessman John Jacob Astor IV had the Maison Astor Paris, Curio Collection by Hilton built to be his Paris home in 1907. Astor had been a part of the hospitality world since the mid-1890s, when he built the Astoria Hotel on the Astor family property in New York. Learn more about the History of Maison Astor Paris, Curio Collection by Hilton .